Michael L. McKinley (Mike) joined the Apopka Police Department on August 31, bringing three decades of law enforcement experience to a city he is proud to call home. Mike is a lifelong resident of Orange County. He attended the University of Central Florida, where he obtained a Bachelor of Science Degree in Criminal Justice. After graduating from the University of Central Florida, Mike joined the Orange County Sheriff's Office. In 2002, Mike earned his Master's Degree in Criminal Justice from the University of Central Florida. He is a graduate of the 254th Session of the FBI National Academy, as well as the University of Louisville's Southern Police Institute Command Officer Development Course. Mike is married and has four sons. He currently resides in Apopka and is a very active member of the community. He volunteers his time mentoring the youth in Apopka, coaching baseball and soccer. As Chief Deputy, Mike commanded the Administrative Services Bureau where he managed the day to day operations of the Human Resources, Court Services/Communications, and Support Services Divisions as well as Media Relations and Technical Projects. 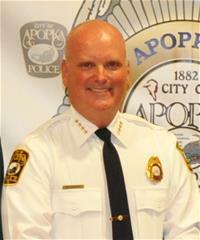 Prior to becoming Apopka Police Chief, he was responsible for the day to day management of the Sheriff's Office's Operational Services Bureau, which is comprised of the Uniform Patrol Division, Special Operations Division, Criminal Investigations Division and the High Risk Incident Command. He was also instrumental in helping develop a data integration program that links disparate law enforcement records management systems and enables law enforcement agencies to share information related to pawned property, persons of interest, and suspect vehicle information. Mike has served on the Board of Directors for the Victim Service Center and CRIMELINE.